The Food and Drug Administration is succumbing to Big Pharma’s influence to keep approving lucrative opioids despite the toll they’re taking on American lives, a top official at the agency claims. Dr Raeford Brown, chair of the FDA’s committee for reviewing opioid approvals, told the Guardian the agency is having a ‘direct impact on the mortality rate from opioids in this country’ by continuing to approve new high-risk drugs. The drug’s manufacturers and the FDA claim that, since the drug will mainly be administered by doctors in hospital settings, there is a low risk of it reaching the streets. Crucially, he told DailyMail.com, ‘the problem is bigger than Dsuvia’. Dsuvia is just another example of the problem that the agency has with the regulation of opioids, he warns. Because once it joins the 896 other opioids on the market, it’s highly unlikely it will come off. 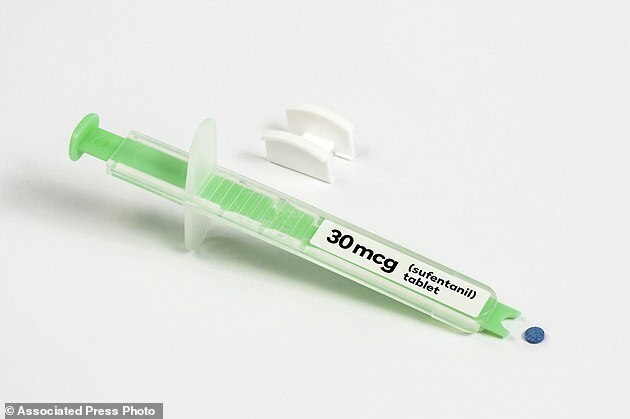 Sufentanil, a cousin of fentanyl, was developed as an option for patients who pose difficulties for the use of IVs, including soldiers on the battlefield. But now it will be available as a single, dissolvable dose for patients in the hospital, at just $ 50 to $ 60 a tablet. The pill from AcelRx Pharmaceuticals contains the same decades-old painkiller often given in IV form or injection to surgical patients and women in labor. The tablet, placed under the tongue with a dispenser, starts reducing pain in 15 to 30 minutes. FDA Commissioner Scott Gottlieb noted the pill was a high priority for the Department of Defense, which helped fund testing, because it wanted a way to provide fast pain relief to injured soldiers. In a lengthy statement, he said there will be ‘very tight restrictions’ placed on its distribution and it is intended only for supervised settings like hospitals. It will carry a boxed warning and won’t be available at drugstores for patients to take home. Instead, doctors will administer a single dose under the tongues of patients in pain in hospital settings. But Dr Brown worries that isn’t enough control over the drug. He predicts that the pill will be abused inside and outside medical settings and cause overdose deaths. ‘Because the drug is used in a sublingual’ – or under the tongue – ‘form, it will be rapidly absorbed by the vasulature under the tongue,’ Dr Brown told DailyMail.com in an interview in October, shortly after members of his committee voted 10-3 in favor of Dsuvia. Dr Brown couldn’t attend the meeting and didn’t cast a vote because he was already scheduled to speak at the annual meeting of the American Society of Anesthesiologists at that time, attended by about 10 other committee members, by his estimation. The vote is not binding, it is just a vote of confidence. But the FDA has tended to heed their advice. However, Dr Brown says the ‘cozy, cozy relationships between the pharmaceutical industry and various parts of the FDA’ often override the committee’s suggestions. Speaking to DailyMail.com, he said he has been astounded to learn about the depths of the FDA’s ties with industry in the last five years he’s spent working with the agency. Dr Brown is not opposed to innovation in the pharmaceutical industry. He says they are doing a ‘great job’ in many ways. But opioids are different. They are ‘a special class of drug and they deserve to be looked at in a substantially different way than other classes,’ he says. And yet, the number of opioids on the market is growing not declining. ‘Once a drug is approved, it’s out there and there’s nothing you can really do about it, and that’s one of the things that I’ve told them when I was up in their face about approving Dsuvia. ‘You can say what you want to about what you have put in place but once that drug gets on the market, it’s out there for anybody to do what they want to with it. Ask Scott Gottlieb how he feels on this issue, and his answer won’t be dissimilar. He’s said many times before that he fully comprehends the gravity of the opioid epidemic and the potential of the FDA’s role to take action. But Dr Brown dismisses his words. He has asked FDA staff to ‘evaluate a new framework’ for the approval of new opioid drugs that will clearly outline how the agency considers benefits and risks. ‘We won’t sidestep what I believe is the real underlying source of discontent among the critics of this approval – the question of whether or not America needs another powerful opioid while in the throes of a massive crisis of addiction,’ Gottlieb wrote.